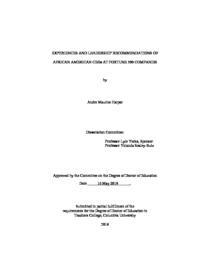 This study focused on five African American Fortune 500 CEOs and their leadership trajectory to becoming a Fortune 500 CEO, their recommendations to emerging leaders, ways in which they define diversity, how they leveraged diversity in their organizations and how if any the racial-social climate impacted how they navigated diversity within their organizations. The researcher identified only 16 African American current and former Fortune 500 CEOs in the history of the Fortune 500. Participants were interviewed either in person or via telephone with the exception of one who opted to submit questionnaire answers electronically. Participants completed a demographic data worksheet along with 10 interview questions. Two findings emerged as a result of this study: 1) All participants (100%) in this study agreed that a Fortune 500 CEOs leadership trajectory should encompass: leadership experience, educational degrees and institutions attended, mentorship and perseverance; 2) All participants (100%) believed they leveraged diversity in their organizations based on their definitions of the term and their methodical approach to incorporating it and; 2a) The majority of the participants (60%) believed that the racial-social climate has impacted their corporate diversity navigation by their actions whereas 40% believed the climate has no effect. This study included recommendations by the participants to aspiring CEOs and other minorities and researcher recommendations to Human Resource Professionals and White Executives. A recommendation by the researcher suggests that a study should be conducted on African American female corporate CEOs and their bouts with leading predominantly white organizations (i.e., critical incidents). The results of the demographic data correlations produced an outline of what characteristics makeup an African American Fortune 500 CEO, see Chapter 4.